Fermentation is the key to kombucha’s probiotic benefits. The blend of tea, sugar, fruit juices, herbs, and more brews for seven to thirty days, but the resultant beverage sells quickly. In six months, The Butcher & The Baker runs through eighty kegs, rotating flavors along the way. Kombucha on tap reduces packaging and transport. Like beer, people also prefer kombucha pints from the keg over bottles and cans that can affect carbonation and flavor. The reviews have been as effervescent as the drink itself. Kombucha on tap claims a slightly sweet and fizzy flavor that is oddly addicting. 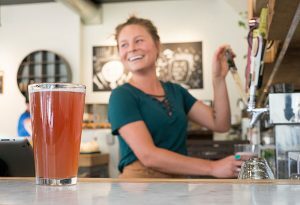 Butcher serves up artisanal, craft-brewed kombucha from Denver-based clinical herbalist Manda Pendleton’s company “In Joy Integration.” Pendleton’s varieties of “cha,” as in kombucha, combine a thoughtful balance of taste and tonic. Each ingredient is handpicked to enhance flavor and target specific health concerns. Immu-Cha is a smoky-tasting, blush-colored concoction of raw and vegan ingredients that support immune health. In Joy Integration’s Chas have what Pendleton calls botanical assistance, basically a selection of herbs added to assist the body in various functions from stress relief to adrenal support. InDevotion Cha contains lemon balm and motherwort herbs, mild antidepressants meant to open the heart center. InVision Cha has herbs including ginkgo balboa to open the third eye and stimulate intellect. This recipe, built from the fermentation of black, tulsi, green, and rooibos teas, is enhanced with organic blueberry juice and especially pleasing to the palate. In Power Cha has rejuvenating ashwagandha and stimulating kola nut, that in combination with organic black tea, yerba mate, guayusa, and organic pineapple make a peppy beverage with energy-boosting effects. Most of kombucha’s appeal comes from its flavoring. 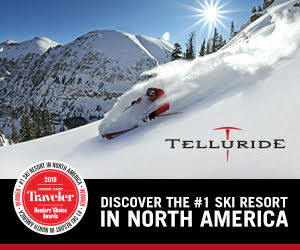 The drink may appear mysterious and foamy, but it’s quite a simple recipe, explains Joanna Grzeskowiak, owner of Telluride Juice Co. The clumps and floaters in your kombucha are scobies, a cluster of bacteria resulting from the fermentation of tea, water, and sugar. The word scoby is an acronym meaning “symbiotic culture of bacteria and yeast.” Grzeskowiak brews an initial batch of kombucha in big, glass vats for three to four weeks to develop a living, thriving scoby. She then flavors her brews with fruits and herbs for three or four days, strains, force carbonates and serves, never in plastic, and always encourages re-useable glassware. Two of her most popular kegs are kiwi/guava and pineapple/passionfruit. The Doc Holliday is another of her popular elixirs. The two-ounce serving consists of turmeric, ginger, lemon, raw honey, apple cider vinegar, and more. Keep a look out for more of Grzeskowiak’s liquid gold in a new space this summer along with the steady flow of kombucha coming from more and more taps around town.